Traditionally the people of Sri Lanka consume vegetable cooked as curries with the dietary staple, rice. Legumes, in general, play a vital role in Sri Lankan diets and they are being consumed as green vegetables or pulses. Edible legumes are excellent sources of dietary protein and oil. Nutritionists expect them to play an important role in meeting food needs, particularly proteins, at this period of food shortages and widespread prevalence of malnutrition. Immature pods of winged bean and to a lesser extent tender leaves and flowers are consumed by Sri Lankans as a vegetable. The potentials of the mature seed as a cheap source of protein and oil has not been exploited fully as yet for which research efforts must be directed. 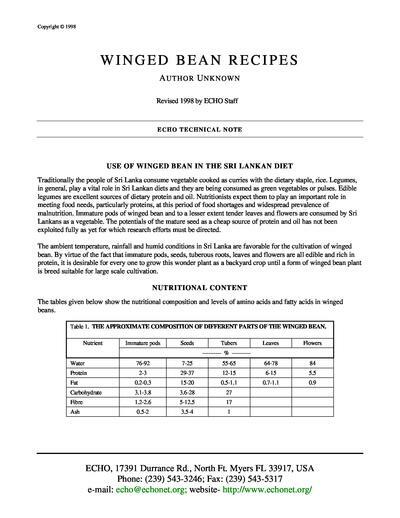 The ambient temperature, rainfall and humid conditions in Sri Lanka are favorable for the cultivation of winged bean. By virtue of the fact that immature pods, seeds, tuberous roots, leaves and flowers are all edible and rich in protein, it is desirable for every one to grow this wonder plant as a backyard crop until a form of winged bean plant is breed suitable for large scale cultivation.